AFSA is not advocating for the withdrawal of all American diplomats from Havana, I found myself explaining to a journalist recently, so no, I would not be providing a quote to that effect. Does that mean I think the health risks are not real, the journalist asked. Of course not. We need to do our best to understand what is happening in Havana so we can do our best to protect our diplomats. But there was more to say. I reminded him that members of the Foreign Service are deployed all over the world in environments that put our health and our lives at risk—from exposure to the Zika virus and dengue fever, to the severe air pollution that has caused adult-onset asthma in some of my friends, to the filthy water and general lack of sanitation that routinely rips up our guts. I recalled that Foreign Service colleagues worked right through the Ebola outbreak in West Africa and were instrumental in containing it. I did not mention the memorial plaques AFSA maintains in the C Street lobby, bearing the names of 248 of our colleagues who have died overseas serving our country. But I thought about them, as I often do, and about the vital importance of keeping the American flag flying at our embassies and consulates around the world. If I had forgotten about the vital importance of our presence, Representative Ed Royce (R-Calif.), chairman of the House Foreign Affairs Committee, reminded me in his opening remarks at the Sept. 26 hearing on management of the State Department. He recalled that the American consulate in Kaduna in northern Nigeria had been closed in the mid-1990s, leaving no Foreign Service eyes and ears on the ground. We have to be present to see these kinds of things coming—and to head them off, I would add. An ounce of prevention, as we who belong to the most cost-effective component of America’s national security team know, is worth at least a pound of cure. To all the members who tell me that they are aware of the risks of their service, but even more aware of the importance of staying at their posts to achieve their mission, I take this opportunity to salute you. I salute you by committing to make a concerted effort to kill, once and for all, the toxic and false narrative that members of the Foreign Service spend their careers trying to dodge hardship service. That’s not the Foreign Service I know, and it’s not the picture of the Foreign Service that emerges from a cold, hard look at the data. Did you know that vacancy rates at greater hardship posts are lower than at non-differential posts? Yes, that’s right. One beneficial result of months of discussions about HR’s proposal to fundamentally change eligibility for promotion into the Senior Foreign Service is that we now have detailed data on vacancy rates at all posts. 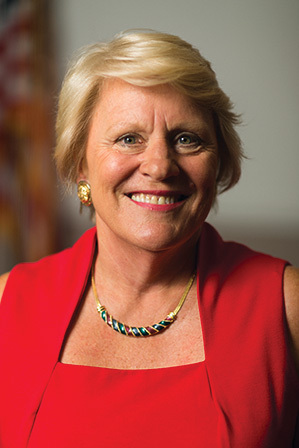 After management asserted that drastic changes—significantly shifting responsibility for selecting the Senior FS from independent promotion panels to HR—were needed to better address staffing needs at greater hardship posts, AFSA asked for data so we could clearly identify the problem, develop a solution and track progress. The numbers surprised us, and I suspect they will surprise you. While non-differential posts have a vacancy rate of 8 percent, the vacancy rate at posts with a 20 percent differential is 6 percent, and at 30 percent posts it’s 7 percent. Write us at policy@afsa.org for full details. The next time someone alleges that members of the Foreign Service don’t step up for hardship service, shut that toxic, inaccurate, irresponsible narrative down. 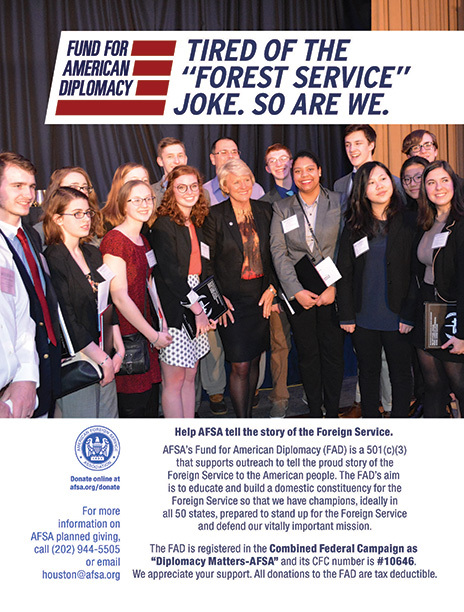 AFSA is here to help you become an effective advocate for a strong Foreign Service.